Six-word recap: No swim, bumpy bike, best run. This was my 8th half Ironman! The Racine 70.3 was my first half Ironman back in 2012. Training was minimal and I wasn't expecting a PR. I did have hopes to beat my original time from 2012! On Saturday, my friend Laura and I headed up to Racine to pick up our packets. On the way there, I noticed the bike on the car in front of us looked a lot like Kelly's bike. Well turns out, it was Kelly's bike. We walked into the expo right after Kelly and Brent! Expo check-in was short and sweet without any lines. 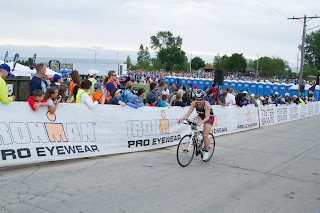 Since I've done a few of these Ironman-branded events a time or two, I am familiar with all the forms and signatures required. Once I had my backpack, timing chip and tshirt, we headed into the store area. 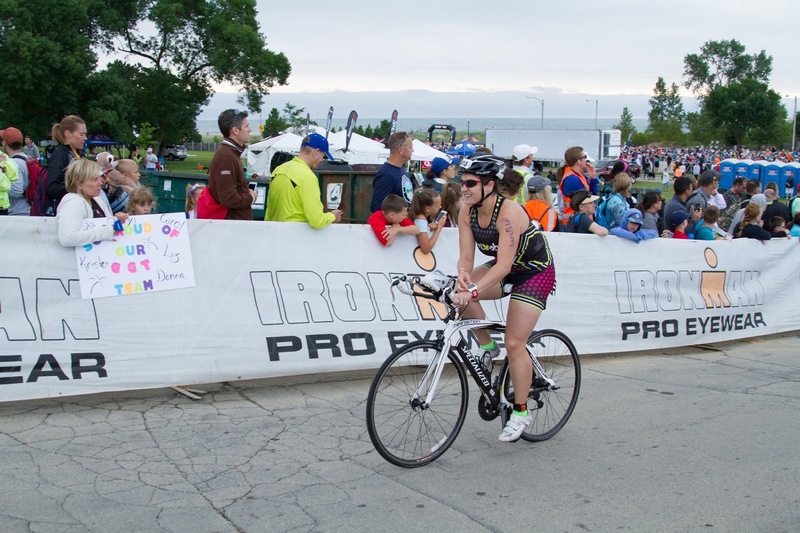 I see Ironman still hasn't caught up with the times and are only offering "IronMate" shirts for women. I guess husbands can't show off their Ironman wives. Since storms were predicted overnight, we opted not to rack our bikes overnight and just bring them the next morning. We didn't go check out the swim area at all, but we heard talk of a possible cancelled swim due to cold temperatures. Laura and I took it easy the rest of the night, packed our bags, ate a delicious pasta dinner cooked by Matt, and hit the hay early for a bright and early wake up call the next morning. I rolled about of bed about 5 am. Everything was laid on from the night before so it was an easy effort to get dressed, drink some coffee, eat breakfast and hop in the car. 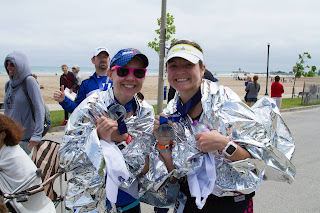 Once we arrived in Racine, Kelly texted me that due to the wind and really cold water temperature, (in the 40s! brrr!) the swim was cancelled. The race would start as a time-trial start on the bike and the start time was delayed about 30 minutes. Laura and I set up our transition area and then headed over to the Vision Multisport tent with Brent and Kelly to relax before the start. Next time I will wear more clothes because it was really chilly that day! I didn't bother to do any warm-ups before the start because I was trying to conserve my energy for the race itself :) Since I had a low bib number, I started relatively early in the time trial start. As the start of the bike goes start up a hill, race volunteers were reminding everyone to stat in a low gear. I helped the woman in front of me gear down on her hybrid bike and while doing so I learned the longest bike ride was about 25 miles 😓 Well, at least I was a little more prepared than that. I took the first part of the bike course easy as we headed out of town. It was a little crowded at this point so I took the time to warm up and get up to speed. I knew the racers would continue to spread out as the course went on. 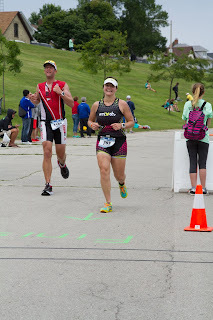 I was racing by feel for this race as I forgot my heart rate monitor (I was really unprepared). I didn't want to go to hard on the bike and blow up on the run. I was able to pick up the pace as the miles clicked off and felt pretty good, especially when the wind was at my back. On the headwind portions, I just stayed aero and kept up a good effort. I was able to pass a few people in my age group on the second half. The worst part of the bike course is that the course roads are crap. So many people were on the side of the roads with flats and I was so glad when we reached the end of bike course because my lady bits were really really tired of the bike. Seriously, so.many.pavement breaks. I'd rather ride the Ironman bike course. With the weather being so nice and cool the run was actually not too bad. The course mostly just follows along the lake with a few out-and-backs and a two-loop format. Kelly was right behind me as we started the run and I knew she would catch up quickly. 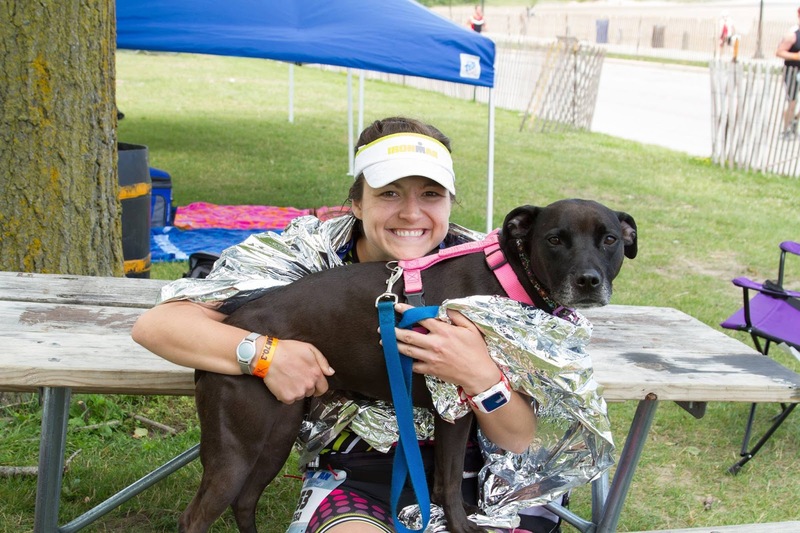 I focused on keeping a consistent pace and making sure to get some water and gatorade at aid stations. Racing with other friends is always a plus because I look forward to seeing them and high-fiving them. Plus it gives you motivation to either stay ahead of them or catch up to them. 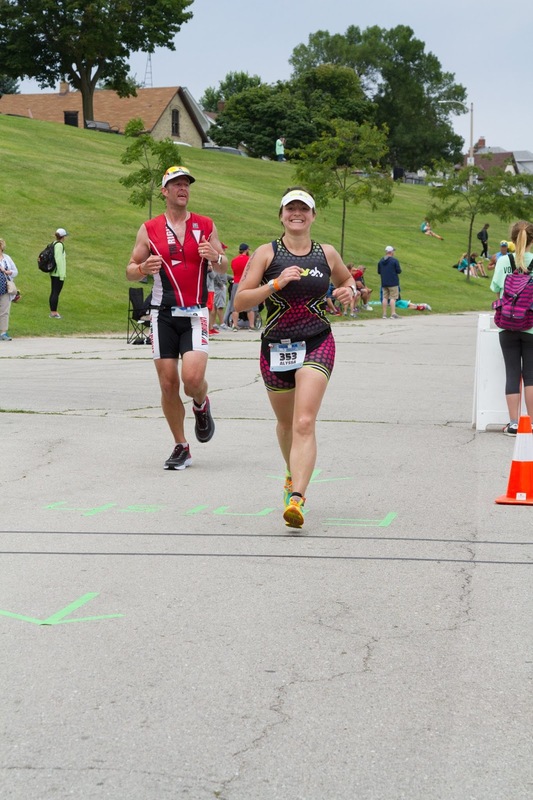 The finish leads you down a nice long hill and I cruised in! I am really happy with how the run went. I was able to run really consistent splits and walked only briefly through aid stations plus the steep hills. It was my best half Ironman run split by over 5 minutes! At the end, I was a little disappointed that the swim was cancelled as I believe I could have broken 6 hours again in the whole race. Oh well, there is always another race! Pros: Ironman races are generally well organized with all the bells and whistles. Close to home so no hotel stay required! Cons: Bike course is no good. Would I do it again? I can't because Ironman cancelled Racine going forward.